For the first time ever, a publisher read something I wrote and asked if I would be willing to read an advanced copy of a book and make a review on my blog. Pretty cool, huh? So, the author is a guy named Russell Rathbun and I have met him before. I wrote about it on this blog. Then, he had come to Chicago with his co-pastor Debbie Blue and one of their congregants, Linda Buturian. I bought and read both of the women's books but, for some reason, was not drawn to Russell's book, even though my pastor and several other folks that I know liked it quite a bit. Russell Rathbun, MDiv, is a founding minister with Debbie Blue of House of Mercy, a pioneering emergent church in St. Paul, Minnesota. Rathbun is also the author of Mid rash on the Juanitos (Cathedral Hill Press, 2009) and the critically-acclaimed Post-Rapture Radio (Jossey-Bass, 2008). He lives with his wife, two kids, and dog KoKo in St. Paul. Now, Russel has written a book as a response to David Kinnaman and Gabe Lyons' book, unChristian. I haven't read the first book, but Russell has written this small chapbook to be part of the conversation that unChristian has started. The basic premise of unChristian is to look at detailed survey data and determine how non-Christians in their late teens to early 30s perceive Christianity. Although I have my reservations about Barna statistics, the method is one with which this little University of Chicago graduate is very comfortable: ask a bunch of multiple-choice questions to a huge bunch of people. Then, figure out trends in the data. What Kinnaman and Lyons figure out is that Christianity has a huge image problem amongst young adults. This is not a surprise to many of us. As a Christian from this demographic, I constantly encounter people who are clearly surprised and intrigued by the inclusive religion I practice that fully acknowledges that human beings are imperfect and that God doesn't really seem inclined to change that, even after someone has made a profession of faith. Christians who practice in a religion that preaches rules and that conversion will fix everything that is wrong in your life tend to be pretty loud, dominating mass media with TV shows, guest appearances on conservative talk shows, books and advertisements for megachurches. Folks like the people at my church are quieter and have smaller in population size. Kinnaman and Lyons document this imbalance of awareness by documented public opinion. They find that non-Christians in their late teens to early 30s think that "Christians are only interested in 'saving souls;' they are hypocritical, anti-homosexual, sheltered, too political and judgmental." Russell seeks to explain these complaints to more traditional Christians and suggest some ways to counter them. 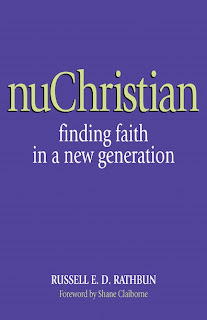 The book is entitled nuChristian and is available here. What is most valuable about this book is the perspective that Russell is taking (I suppose using correct journalism means that I should use his last name. But I've met the guy! It feels weird. I'm going to go ahead and keep breaking the rules.) Russell is not writing this book for people who do not like the church. He is not trying to convince anyone they are wrong for thinking such things. He is also not writing for an audience full of emergent Christians: preaching to the choir, as it were. Russell seems to be trying to explain to folks like his own father what is going on with this new generation of young people and to insert his own experiences as a pastor to these folks as illustration for how these young people can best be assisted in living lives that are more spiritually fulfilled. Personally, this book is most useful to me as a resource to hand to someone I love who is a Christian but who just doesn't understand why I am so excited about emergence. I think it is most useful as that kind of resource because Russell speaks the language of more traditional Christians. I think he must be in his 40s (about a decade older than the folks he is writing about) and he traveled the traditional path to pastorhood, even though he started a ground-breaking church once he graduated from seminary. I don't know how to say this but the rationale behind a lot of the things he says is very Jesus-y. Also, his vocabulary sets up a dichotomy of spiritual identity. He talks about Christians and non-Christians. I am much more comfortable with talking about spiritual identity as a continuum since I believe that we're all moving forward and backward on our paths in relationship to God. To create an arbitrary milestone that everyone has to have crossed and can never go back to in the form of saying the words, "Now I follow Christ" seems unnecessarily exclusionist to me. But I am not the target audience of this book. Folks who have never tried to wrap their heads around that idea (and many other emergent ideas like how culture affects church life or Christianity as something other than a rules-based religion) are the audience of this book. And I think Russell reaches out to those folks well because I can't connect with some of mechanics he uses to get his message across. I am too deeply entrenched in the post-Modern mindset that he is describing to be an effective translator. It's like listening to your own voice mail. The things Russell says are accurate just like it is actually my voice talking but because it coming from a different context, I get agitated at its unfamiliarity. However, my agitation is the price I pay for recommending this book as a resource to Modern-thinking folks about why emergents are the way they are. My father read "Chapter 6: Sheltered from God's Children" and brought up what I think is the only weakness in the book's focus. He said, "I can't tell if Russell wants me to be more like a nuChristian or not." nuChristian is Russell's word for folks who identify as Christian but who are part of the post-modern generation and, therefore, different than Christians that have come before. My dad's confusion is totally understandable. To Russell's credit, he publishes a conversation he had with his father and it turns out the generational misunderstanding is common. DAD: It seems that there are a lot of differences. In some ways you are saying to be able to reach out and minister to these new generations, I have to change my theology. ME: I don't think I'm saying that. DAD: It sounds like it. I have to change what I think about homosexuality , abortion, politics, the Bible, salvation . . . [laughs]. . . about the belief in absolute truth. ME: That does seem like a lot of things. But I am not saying that you have to change what you think about these things. I am just suggesting what I think most postmoderns think about these subjects. And I am not trying to suggest that they all think the same way on any particular subject, I am trying to talk more about how they approach things. I'm looking for a final quote where Russell clears this all up and there isn't one since the way we approach things is often entangled in what we believe. So, folks with Modern perspectives like our dads are always going to feel that if their approach has to change, so will their beliefs and it is always scary to consider one's beliefs changing since then we will probably have to change the way we live our lives, which is always uncomfortable. And isn't changing the way we live our lives equivalent to changing our approach to things? It's a difficult task to resolve that circularity of intent and I do not blame Russell for being unable to do so. There were several brilliant moments in the book where he put concepts into words with a clarity I envied. Because of that, I do recommend the book as a great resource for folks outside of the movement or the generation or for folks inside the movement or from the post-Modern generation who need some help in translating their experiences.